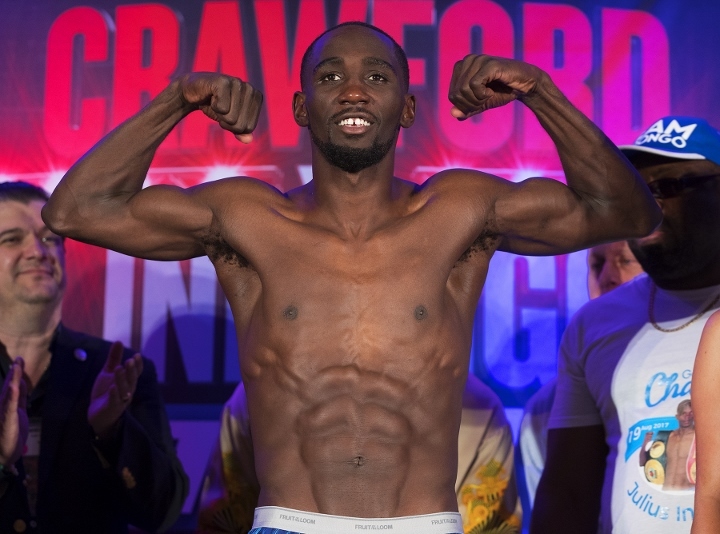 Undefeated 140 pound world champions TERENCE "Bud" CRAWFORD and JULIUS INDONGO, collide in a world title unification battle, Saturday, August 19, at Pinnacle Bank Arena in Lincoln, Nebraska. The winner will be crowned the first undisputed king of the 140-pound division of the four-belt era. 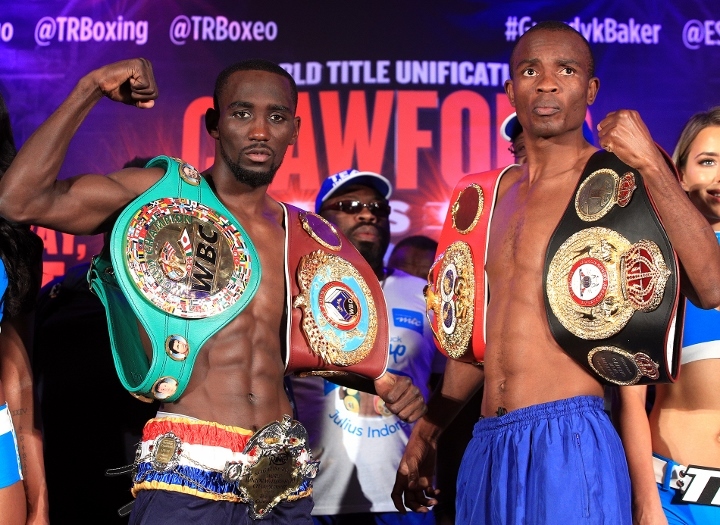 Photos by Mikey Williams/Top Rank. 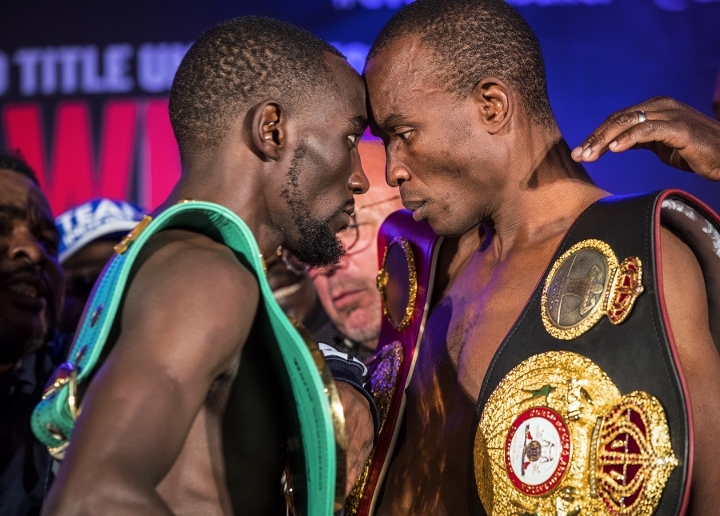 The rumble between Crawford (31-0, 22 KOs), from Omaha, the two-division world champion and 2014 Fighter of the Year and the holder of the World Boxing Organization (WBO), World Boxing Council (WBC) and The Ring magazine world titles, and Indongo (22-0, 12 KOs), from Windhoek, Namibia, the International Boxing Federation (IBF) and World Boxing Association (WBA) world champion, making his U.S. debut, will be televised live and exclusively at 10 p.m. EDT on ESPN and ESPN Deportes and stream live on the ESPN app. 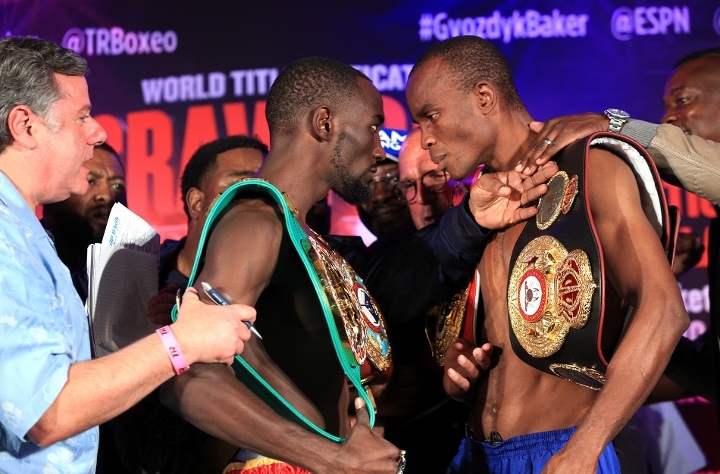 Indongo, the ultimate road warrior, won all his world titles on foreign soil. The live telecast will open with NABF/NABO light heavyweight champion and 2012 Olympic bronze medalist OLEKSANDR GVOZDYK (13-0, 11 KOs), from Kharkiv, Ukraine, defending his titles against CRAIG BAKER (17-1, 13 KOs), of Baytown, TX. Gvozdyk, world rated No. 2 by the WBC, No. 3 by the WBA and WBO, and No. 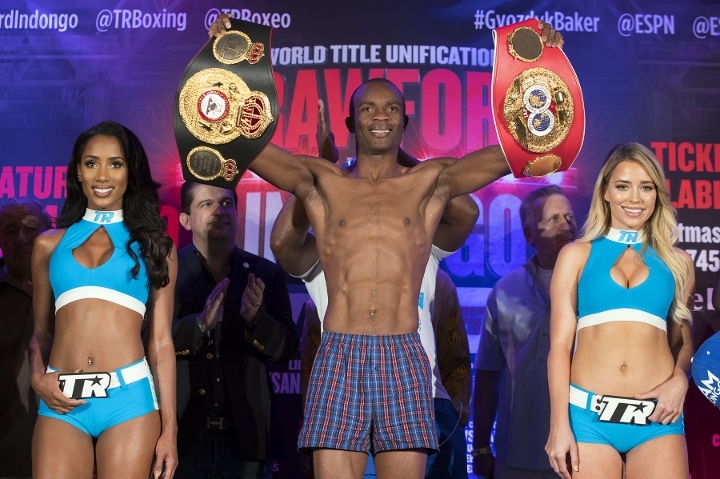 5 by the IBF, risks his path to a world title shot against Baker, whose last five victories have come by way of knockout. The telecast will also feature 2016 Olympic silver medalist SHAKUR STEVENSON (2-0, 1 KO), from Newark, NJ, in a six-round featherweight bout; against DAVID PAZ (4-3-1), of La Plata, Argentina. 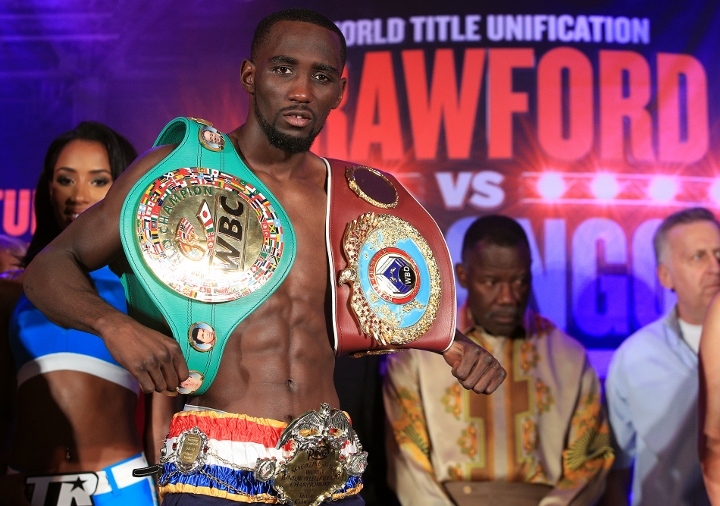 Promoted by Top Rank®, in association with Matchroom Boxing, remaining tickets to the Crawford vs. Indongo world championship event are priced at $128, $78, $53, and $28. They can be purchased online via www.ticketmaster.com, by phone at 1-800-745-3000 and at the Pinnacle Bank Arena main ticket office, located in the south lobby, Monday -Friday, 11:30 a.m. to 5:30 p.m. CT. Doors will open at 5:00 p.m. CT.
GREAT SCRAP!!!! 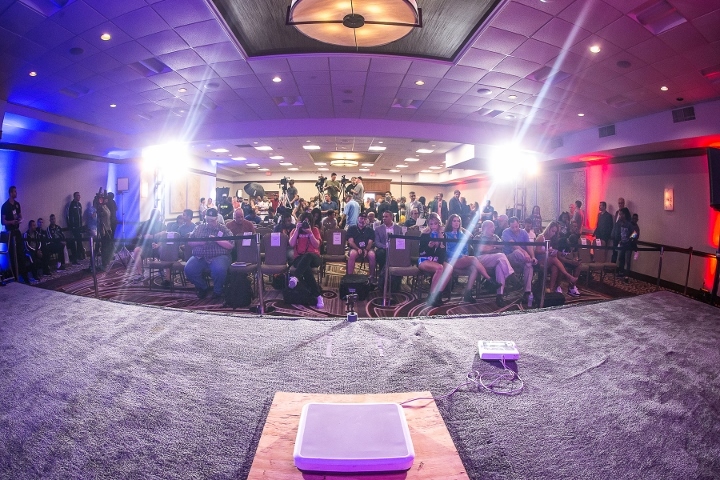 Looks like weigh in got some what intense.... 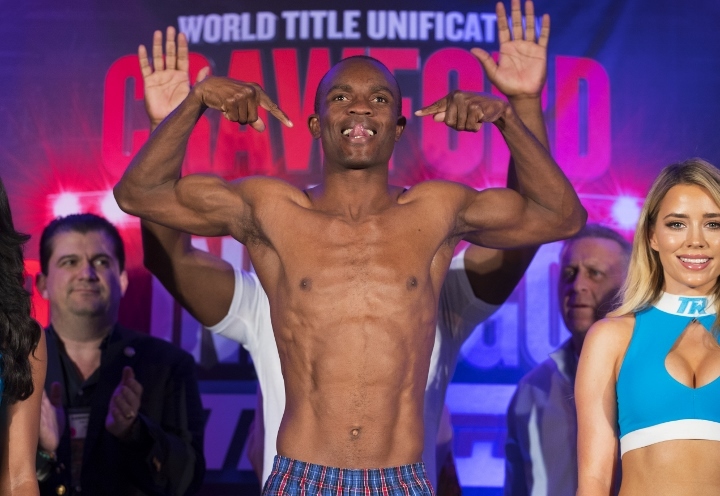 I hope indongo shows up to fight! Otherwise TC is having an early night.